Are you a Globe Prepaid user and your Mobile Hotspot is not working? When you try calling or Live chat with Globe Tech Support, they always say “Mobile Hotspot feature is only for POSTPAID ONLY!” Nope! I’m a Prepaid user and I can use my Mobile Hotspot. Here’s some proof (see photos below). That’s it! Enjoy your Mobile Hotspot feature! Note: Only works in BBMax. To subscribe, dial *143# and press Call button. When your BBMax expired, your Mobile Hotspot will not work again. Else, contact Globe again. Be wary everyone, Globe is “cracking down” on Blackberry OS7 prepaid users for using their Mobile Hotspot, as we all know Globe is not permitting Mobile Hotspot for BlackBerry OS7 prepaid users. Some users are receiving the following warning message from Globe for using the Mobile Hostpot. You have breached the Globe fair use policy for data usage. In order to maintain quality of service among all Globe subscribers, your speed will be throttled to 2G speeds. To enjoy normal speeds, you may opt out from your current promo. Text STOP to 8888. Regular browsing charges will apply. 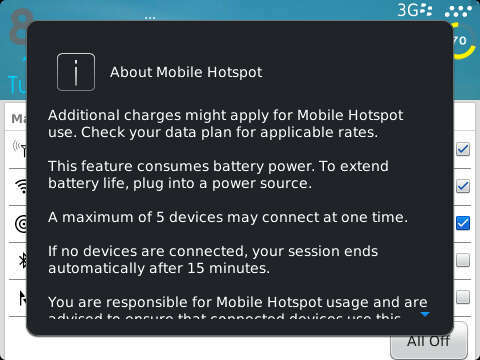 So Blackberry OS7 prepaid users, use Globe Hotspot at your own risk kids. I’ve done that and it works but once my bbmax expires, mobile hotspot won’t connect again. How about yours? It does work! If your BBMax expires, you just have to subscribe again and call Globe to refresh your service books to reflect that you’re subsrcribed to their BBMax service. Btw, your theme is gorgoues! Do. You mind sharing it? I can’t find any decent theme on AppWorld.